The first church opened on this site in 1803. It became the church of Samuel Marsden, the "Flogging Parson". It was the only church in the colony until 1809. 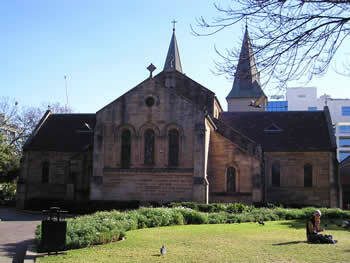 In 1810 Macquarie began remodelling, and the towers were completed in 1819. The original building was demolished in 1851, replaced by the current structure designed by James Houison. The transepts were added in 1882 by Edmund Blackett.